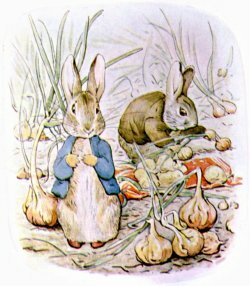 As soon as they had passed, little Benjamin Bunny slid down into the road, and set off -- with a hop, skip, and a jump -- to call upon his relations, who lived in the wood at the back of Mr. McGregor's garden. That wood was full of rabbit holes; and in the neatest, sandiest hole of all lived Benjamin's aunt and his cousins -- Flopsy, Mopsy, Cotton-tail, and Peter. It looked as though some person had been walking all over the garden in a pair of clogs -- only the footmarks were too ridiculously little! London, Frederick Warne & Co., Inc. (1904, 1932).